At Crabtree Farms, Chattanooga’s community-focused, urban, sustainable agriculture farm. Step into the new year with the clarity of eating from a place of mindfulness and balance. Holli Richey, Registered Herbalist with the American Herbalist Guild and a psychotherapist practicing in Chattanooga, will guide participants through an afternoon of learning more heart-fully the art of eating from a conscious place. This workshop will combine tangible ways in which to eat more mindfully, while also engaging in a serene and centering group eating experience. Holli was a creator and facilitator of a year-long mindful eating program at Center for Integrative Medicine. This workshop will be an experiential, condensed version with lots of applicable tools to nurture a balanced practice of eating forever. In August 2015, Tennessee’s Wildside adventured into the Tennessee Citico Wilderness to film naturalists and people seeking a day of reconnecting with their wild side. Bill and Laura Hodge organized the event, sponsored by Wild South and SAWS. I was honored to have Tennessee Wildside come along to film the edible and medicinal plant hike I led to Fall Branch Falls. This is one of my favorite areas in East Tennessee’s Wilderness region. Medicinal plants abound right at the trailhead and throughout the entire hike. In August, it is a cool, moist day in the 70s, a refuge in the southern heat. It’s winter now as I post this, but at the end of February, the earliest of spring ephemeral wildflowers will soon emerge. Once the days start getting longer after the winter solstice, I’m already dreaming of spring wildflowers. I post this now to remind us of the beauty to come, and urge people to get out and enjoy our precious wilderness areas in 2017. I’ll be leading some edible and medicinal hikes this year. Stay tuned! And PLEASE! contact TN Congressman Chuck Fleischmann to tell him to sign the Tennessee Wilderness Act. It takes an act of congress to protect Wilderness forever, which is a forever “thank you” to those who made it happen. Wilderness is where you can lose your urban worries, and find the wild heartbeat in your soul. Don’t you think we need that right now? I hope you make it out into the wilderness this year. You can be transformed in just one hike. Forest bathing is a practice of being present, opening our senses to receive all of the forest. It isn’t about taking your clothes off to literally bathe. It’s a figurative use of the word, as in to fully bask in the atmosphere. Experience the life-changing practice of mindfulness in nature. Be present with the body and senses. Simply rest in natural awareness, grounded, and discover the intimate engagement of life within life. Within this sacred context, gain skills in how to work with difficult thoughts and feelings to reduce stress and anxiety. 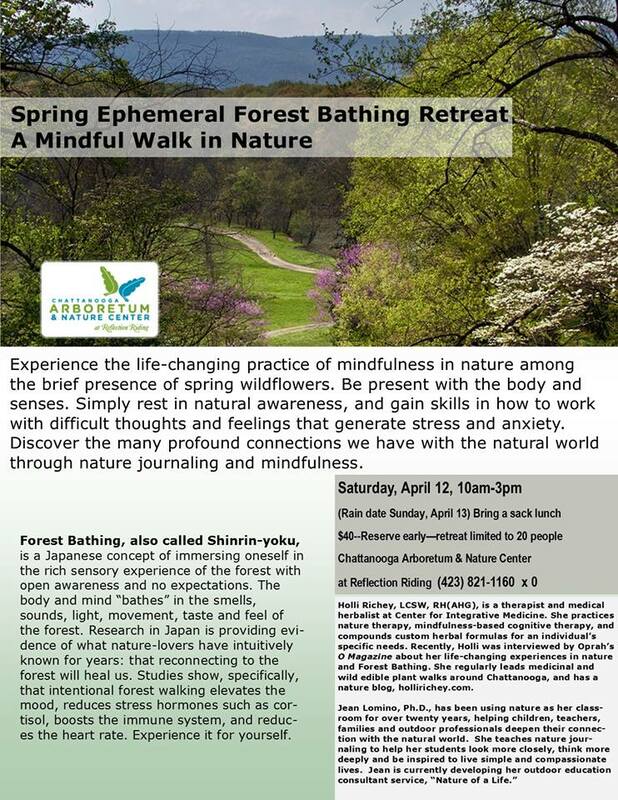 Forest Bathing, also called Shinrin-yoku, is a Japanese concept of immersing oneself in the rich sensory experience of the forest with open awareness and no expectations. The body and mind “bathes” in the smells, sounds, light, movement, taste and feel of the forest. Research in Japan is providing evidence of what nature-lovers have intuitively known for years: that reconnecting to the forest will heal us. Studies show, specifically, that intentional forest walking elevates the mood, reduces stress hormones such as cortisol, boosts the immune system, and reduces the heart rate. Experience it for yourself. We will meet at the Elsie A. Holmes Nature Park in Ringgold, GA of Catoosa County. 88 Ben Holmes Road, Ringgold, GA 30736 http://www.catoosarec.com/elsie-a-holmes-nature-park.html Elsie Holmes Park is along the South Chickamauga Creek and is home to trillium, bloodroot, Jacob’s ladder, Solomon’s seal, enormous green dragons and the endemic Mountain Skullcap. Bring your lunch and something light and portable to sit on (plastic bag will do) to eat by the banks of the South Chickamauga Creek. Wear shoes with good tread and if you have a hiking stick or pole, it could be useful on the last, short segment, which is a fairly steep incline. After the walk, we will be in the screened pavilion for the lecture on herbs for stress reduction. There are restrooms located near the pavilion. Holli Richey RH(AHG), LCSW is a registered herbalist and mindfulness-oriented psychotherapist practicing mind-body-spirit care at the Erlanger Community Health Centers in Chattanooga, TN. Holli has studied plant medicine for 20 years and has led plant walks for 15 years. Holli facilitates nature-based therapy, herb walks and Forest Bathing (shinrin-yoku) retreats in the mountains of southeastern Tennessee. Holli graduated from Maryland University of Integrative Health with a MS in Herbal Medicine and the University of Georgia, School of Social Work. Visit her blog at hollirichey.com. 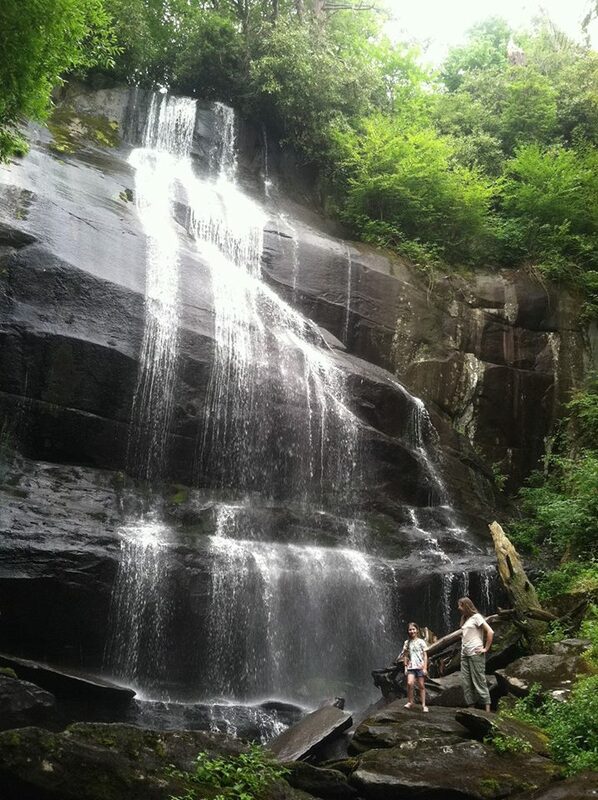 Standing at the base of Fall Branch Falls in the Citico Creek Wilderness of the Cherokee National Forest with a young naturalist. Photo by Pat Byington, 2014. Looking for some exploration in our big backyard? TN Wild is hosting the Tellico Wild Festival in Tellico Plains, Tennessee, with lots of fun, nature-loving things to do Friday, July 31st – Sunday, August 2nd. I’ll be leading an Edible and Medicinal Plants Walk on Saturday. The Edible/Medicinal Hike is currently full with a waitlist, but there are many great hikes, boating adventures, and learning events going on throughout the weekend. This is the place to cool off in the heat of high summer, while also supporting the coolest regional land conservation group around. TN Wild advocates for the passage of the Tennessee Wilderness Act sponsored by Sen. Lamar Alexander, which increases the Wilderness designation of land already held by the National Forest Service. The Poster for TN Wild’s Tellico Wild event. And detailed list of events each day of Tellico Wild Festival. 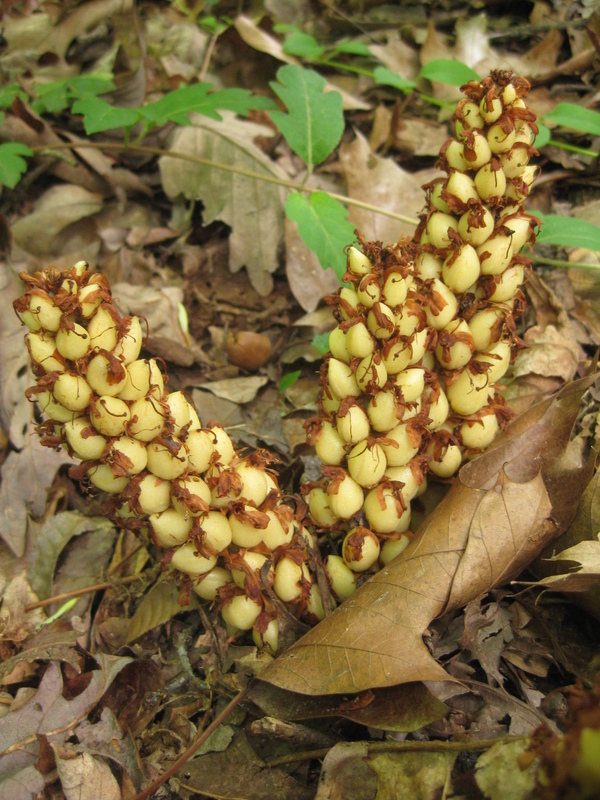 Bear corn, squawroot, cancer-root are a few names of this non-photosynthesizing parasitic plant commonly found under oak trees. Holli will be leading an edible plant walk at 4pm. Sign up inside. Holli will be leading a Fall Foraging Event Saturday, Sept 13, from 11:30-1pm. Admission is free.